I got to give it to Coca Cola. I love them. They always soothed me, ever since when I was born. Coca Cola is part of me as much as my mother and my grandmother, Coca Cola is up there, close to god and all. Yeah. I numbed the pain of seeing my parents fight with Coca Cola. And sugared my way through their divorce and her death. Coca Cola tasted good and gave me energy to create fantasies where things looked just like in a commercial. For a moment I could be all that happy, I could open smiles, open happiness, reach for the stars, and be the real thing. You probably saw the American version of that commercial? This one is with Diego Maradonna. It is 1982, the Fakland islands war had just delapidated the country (Argentina), a military government was on its way out, but we had football and a world cup, and he is, well, he is Maradonna. We did not win that time, but we won in 86. Coca Cola was there too. By the time I was 12 I had a strong sugar addiction of course, and one that did not go away, errr, ever. On my first trip to India I asked god directly to “give me the death I needed”. I asked Shiva in particular who is very popular in India. And get the death I needed I got. I discovered in that trip that I had an addiction to love as well as to caffeine. But what I did NOT realize up until two weeks ago is that my biggest addiction is to sugar. Thanks Coca Cola. I associate sugar and carbs with happiness, with youth, vigor, energy, olympic athletes etc. I associate not-sugar with old age, decrepitud, wheel chairs, and hospitals. So when I weighed myself at the scale of the Doctor on a routine post-Lyme disease check three weeks ago, and noticed I had gone 4 pounds heavier all hell broke loose. Not me! I read everything I could on how I could go about releasing these 4 intruders. Came accross Tim Ferris’ diet on his four hour work week blog, and voila!, sugar is the culprit. Well, sugar may or may not be the culprit but that is when I realized, I AM AN ADICT. For two weeks now I tried eating no sugar. Did not work. The only thing that works so far is to compromise, I have one cup of tea with two sugars and one of my Ezequiel (organic sprouted totast) can have a tiny bit of marmalade on top of the almond butter. Then that is it, no more for the day, other than perhaps one fruit in the afternoon, when I get that dreaded feeling. This woman did it. She cleaned herself from sugar. The book is great in that it talks about how when you let go of something as powerful and as ingrained in your life as sugar you need to have grievances processes. You need to deal with the emotions that come up. You need to add new things that will substitute the past highs you would get while sugaring it up. I have not had a Cocal Cola since last summer, when I secretly tried a sip of one we had left over from a party and did not like it at all. Good bye Coca Cola, and let the mourning from things sugary begin. By the way, if you are into football, here is Diego Maradona in 1986 (in blue), against England, in the semi finals, going through about 5 men, taking the ball from the mid-field and going for it. Unstopable. He was pretty much a God after that. Coca Cola is there in the final moments if you notice AND at 1.39 when he jumps in celebration. We won that world cup. We have not won since. Oh dear. I can&#39;t live without sugar. I know, baaad baaaad girl, but life is not the same without it.<br />Truth is, I have been thinking about it, about giving up the sweet thing. I am usually careful of what type of sugar I ingest but I fully acknowledge this is an addiction. I&#39;ll check out this book too, thanks! in my childhood days sugar was not an issue. as i have aged it is.<br /><br />thank you, for sharing. I wonder why they haven&#39;t yet come up with a &quot;stevia-coke&quot;. Keep it up! It took me about three weeks to get rid of my bread addiction ;)It works and it&#39;s worth it! Thanks for sharing your thoughts. I have to get this book too, Claudia, lol. 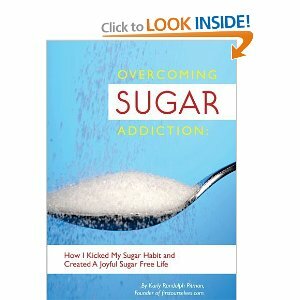 Unfortunately, sugar substitutes are often terrible and without drawbacks of their own. Hope all is well for you and James. Ari, I agree, sugar substitutes tend to be pretty bad except this Setva which is claimed to be completely natural, originally from Peru(?) I think… I happen to not like the taste much but as Uta says, it does give a good feeling to know that one can control his or herself… It is kind of hard for me around sugar but I am trying!<br /><br />All is well, thanks for your comment. Allow me to join the club of addicts then, no sugar here but coffee and soccer! I remember that match, the finals, Mexico 86&#39;, we went bananas in Vzla and I spent a few days w/o a voice!!! Diego Armando became a god after that, he WAS the guy, I still watch it and is unbelieveable what he did. Funny how I wanted to move to Argentina after that, lol. Next worldcup Brazil!!! hope to be there! Also, have you tried raw unrefined sugar? That coud be a choice too.